There’s been a curious amount of discussion among law firm marketers, this New Year, about branding. When it comes to launching brand campaigns for law firms, the past two years have been as flat as the world before Magellan. It seemed as if everyone locked down the steering wheel and few boats left the harbor. However, one seaworthy crew from a well-established Norfolk Virginia law firm, with roots back to 1918 and offices overlooking the lovely Elizabeth River and the world-famous Port of Norfolk, smartly set sail on their journey despite the gloomy outlook. I had an exceptional opportunity to converse with the ever-illustrious, first-rate mate, Janet L. Davis, (JLD) law marketer at Kaufman & Canoles, P.C, last month after the launch of her firm’s fresh new branding and client service initiative that was in the making since 2007. The following summarizes some of the detailed information, she so generously shared, about how her firm developed core values and incorporated them into a firm wide brand identity that encapsulated what the firm stands for, and how that identity helps them focus internally. Perhaps her experience will give you some wind for your sails. JN: What was the over-riding or critical event that caused you to revisit your core values and carry out a full-on client service initiative? 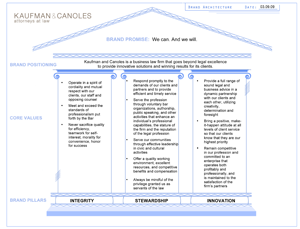 JLD: Kaufman & Canoles has always been proactive in regularly reviewing their strengths and weaknesses internally with their lawyers and staff, and compare them to other law firms in our market. We continually conduct casual interviews with our clients to determine their satisfaction and recommend areas for improvement. However, the key event was our new chairman’s commitment to branding as part of his vision for leading the law firm into the future. JN: How did you get started? JLD: In 2007 we conducted an internal attorney survey, using an online survey tool, to uncover their opinions on the strengths, weaknesses and opportunities for the firm. In 2008 we enlisted our marketing firm, OTTO, to conduct personal interviews with 20 select attorneys to dig deeper into their thinking, their personal vision for the firm and their opinions on various management and client service topics. JLD: After further refining of the value statements through a newly formed Branding committee which consisted of key attorneys, the Director of Administration, the Marketing Director (me), and our CEO, Bill Van Buren, and with the help of our outside marketing firm, we distilled these 11 core value statements into three easy-to-remember ideals; integrity, stewardship and innovation. We knew that these core values were important to the future of the firm. During the internal launch of our new brand we formally presented the entire staff with a brand architecture model providing a visual framework for the core values and brand promise. JN: I understand that the branding campaign wasn’t limited to a new tag line, but also placed a high priority on getting the firm to buy into a new era of service. JLD: Yes, we believe the core values must adopted by everyone in the firm from the receptionist to IT to secretaries to attorneys. Each person has a specific and important role to play as they interact with our clients and their peers. So, we implemented GEM-Going the Extra Mile. The GEM program recognizes staff members who adopt and personify our core values. Any person can nominate any one in the firm and a prize and certificate are given out monthly to the winner. Winners are photographed accepting the award and the photo is posted in the firm’s newsletter. The firm also has The Beryl Atkinson Award; given annually, with a generous cash award, to the staff person who exemplifies the firm’s commitment to client service. JN: What do you consider the highlights of the client service part of your brand initiative? JLD: Return calls or emails within 24 hours; give feedback and updates to our clients about their cases – sometimes regardless of whether they want them (i.e. Hunter Sims video ); and offer more educational seminars and newsletters for clients with the latest, relevant information for their business. JN: What were some of your first obstacles? JLD: Variety and diversity of opinion about what the new brand identity should look like. JN: What are the ongoing challenges? JLD: Successful branding can’t be completed and placed on a shelf. We continually look for strategies to reinforce our core values among staff and promote them consistently to our clients through our actions. JN: How long did it take to get things going and how long did it take to arrive at a point where you felt you achieved your goal? JLD: Once the momentum started, most people were on board and excited about the prospect of having a unified reason to be the very best law firm we could be for our clients and for future generations. The process took about 12 months. Thanks Janet. 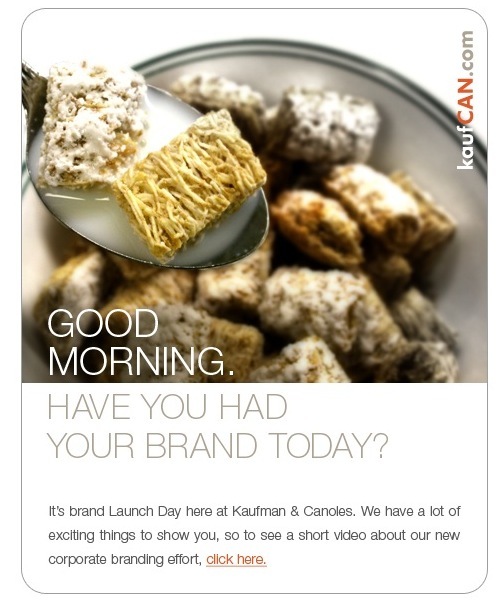 Visit www.kaufcan.com to see their BRAND new website. Check out the videos tab on the upper right utility bar. They’re some of the best I’ve seen! Jayne – I particularly like the focus on enhancing client services levels. For law firms, and other business services providers, brand and reputation are about expertise, effectiveness and experience. Nobody every recommended a law firm because they have a really cool “look” – but they might recommend them for being great to work with, creative problem solvers or highly responsive. Paul, couldn’t agree more. In fact, the whole brand thing needs to be driven by the firm’s desire to be simply the best at the basics. 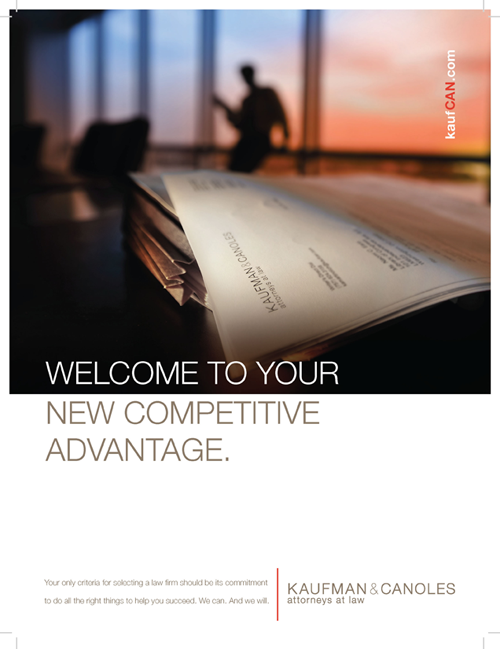 Here’s a link to an article on my website about the competitive edge delivering on the basic category benefits can bring to a law firm. Thanks for stopping by the VMO. Hope to see you in Denver.